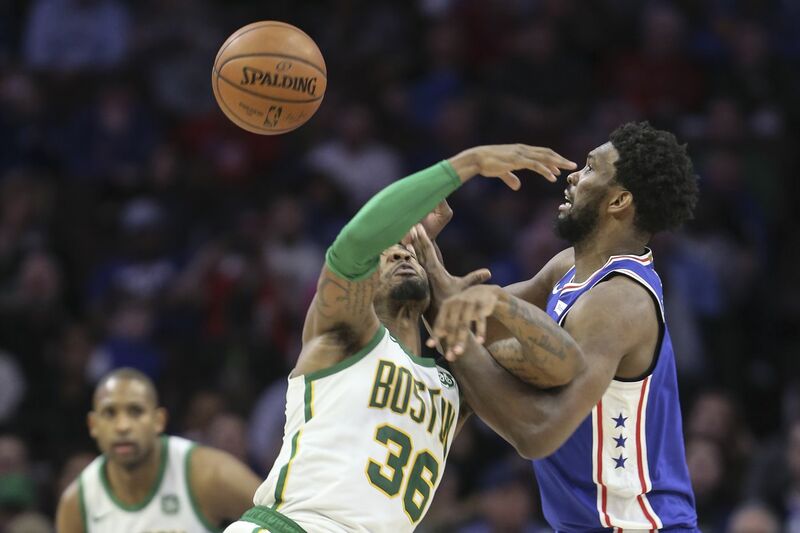 Sixers' Joel Embiid tries for the loose ball with Celtics' Marcus Smart during the third quarter at the Wells Fargo Center on Wednesday night. The 76ers defeated the Boston Celtics, 118-115, Wednesday night at the Wells Fargo Center. - The Sixers are the NBA’s hottest team due to their win combined with the San Antonio Spurs’ 110-105 setback to the Miami Heat. Philly the longest active winning streak at six games. In addition to Tuesday’s win, the streak included victories over the Charlotte Hornets (Tuesday), the Milwaukee Bucks (Sunday), the Sacramento Kings (Friday), the Cleveland Cavaliers (March 12) and Indiana Pacers (March 10). - The disdain the Celtics and Sixers have for each other was visible before, during and after the game. A lot of the attention went to Marcus Smart’s third-quarter ejection for shoving Joel Embiid in the back. However, Boston’s Terry Rozier III fired shots at Embiid the day before the game, calling the two-time All-Star “lame.” Rozier and Embiid have a history. The two got into a shoving match in Game 4 of last season’s Eastern Conference semifinals series. Embiid called his location “Lametown” on a Wednesday night post-game Instagram post in response to Roziers’ “lame” statement. - Sixers coach Brett Brown has been in postseason mode for the second consecutive night when it came to his rotation. All five of his starters – Ben Simmons (42 minutes, 24 seconds), Embiid (41:10), Jimmy Butler (37:09), Tobias Harris (36:40) and JJ Redick (31:56) – played more than 31 minutes. Meanwhile, Mike Scott (20:54) and James Ennis III (16:25) were the primary reserves. T.J. McConnell (8:49) and Boban Marjanovic (4:33) were the other Sixers to receive minutes. - Best performance: Embiid gets this award. He finished with a game-high 37 points and a career-high 22 rebounds. Embiid also made a career-high 20 foul shots in 21 attempts. He is averaging 38.5 points and 18.5 rebounds in his last two games. - Worst performance: I had to give this to McConnell. He missed all four of his shots en route to be held scoreless for the second consecutive game and fourth time this season. - Best defensive performance: This goes to Simmons. The Sixers point guard had game highs of three steals and two blocks. - Worst statistic: This goes to the Sixers reserves shooting a combined 3-for-16. -Best statistic: This goes to Sixers making 39 of 43 foul shots for 90.7 percent.